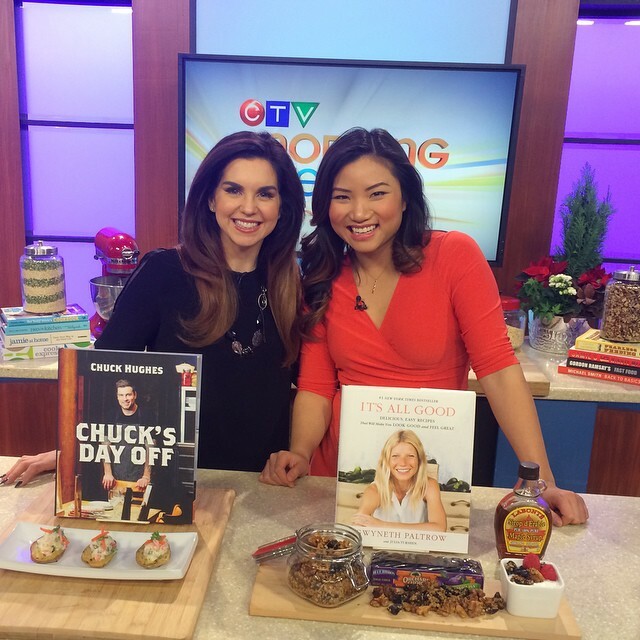 Today on CTV Edmonton Morning Live, Kim Wynn and I reviewed my top cookbooks for gifting this holiday season. Check out the segment here, descriptions, recipes and purchase links below. Searching for a gift that keeps on giving? Buying for the Busy Mama? Manly Man? Clean Eater? or Money Saver? Consider wrapping up one of these awesome cookbooks. The first cookbook I received, from my mother, was the original “Looneyspoons.” It was full of cheeky humour and perfect family friend recipes. 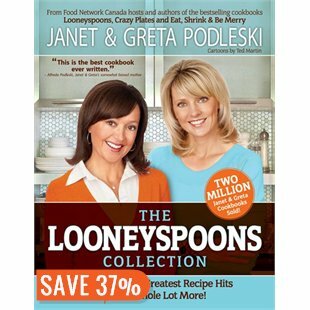 I was thrilled for the launch of “The Looneyspoons Collection,” which holds the best dishes of the first Looneyspoons installment and a host of new delicious and healthy recipes. Give this cookbook to the busy mom looking for extra help with menu planning, or just new recipe ideas to get the kids in the kitchen and running to the family table. Festive, colorful with orange, rosemary & garlic…Kids love that saucy sweet flavor and parents love the 40 grams lean protein per serving. When you love food as much as I do, half of your bucket list is actually restaurants to visit. I was in Montreal recently and enjoyed an amazing meal at Chuck Hughes’ restaurant, Garde Mange. Chuck hosts a Food Network show called Chuck’s Day Off. He’s known for loving locally sourced ingredients and preparing addictive comfort food. While the food in this book is amazing, the photography equally shines. It is beautiful. Give this cookbook to the seafood fan on your list. Chuck has so many amazing recipes that let seafood, simply shine. Baked potato skins are quick, easy and naturally gluten-free. As a source of calcium and fiber they make great “boats” for your next seafood salad. This book features a stripped down approach to eating – it’s fresh, unaffected and delicious. Give this cookbook to anyone with food allergies, intolerances or following an “elimination diet.” It features sample weekly menus for whatever your food needs might be – vegan, family friendly etc. It takes out a lot of the guesswork. This granola uses quinoa flakes and is excellent source of fiber, protein and essential fatty acids. This cookbook features 120 tasty & nutritious recipes to save you money. It doesn’t feature inexpensive food per say, but savvy food and more importantly savvy preparation. What I like most about it: It features real money saving “cooking techniques.” For example, how to debone and chop a whole chicken into parts. This is a huge savings compared to pre-packaged/pre-cut chicken. Also, nutrition information for all recipes is at the back, so you know what you’re eating – and if it’s a good choice for your lifestyle. Inexpensive, vegetarian and simply healthy. Rich in fiber, protein, iron and folate this soup t is sure to keep your energy up. Happy everything, to you and yours.